Brief Synopsis – An elderly couple makes a suicide pact so that neither will have to remain alone when the other one dies. My Take on it – This is a film that I recall hearing about back when it came out because of the fact that it was such a controversial subject, but even after 35 years, I had never had the opportunity to finally see it. It’s a made for TV film based on a play and it was one of the very first HBO’s original films ever made. I’m actually quite glad that I didn’t watch this as a child because I wouldn’t have understood it as well back then as I do now. This film has a very interesting plot that remains controversial even after 35 years. They do a wonderful job getting their message across. The script is written so well that even though the character’s make a choice that many people would disagree with, we can still all understand why they make such a decision and support their choice. It doesn’t matter what one’s views are on the subject itself because by the end of this film, we care about the characters. The choice to cast Hollywood legends Jimmy Stewart and Bette Davis in the two lead roles was an ingenious move because eventhough we are familiar with them, they seem like typical grandparent figures in this film that we all can relate to and care about even more. Bottom Line – Great premise that is does a wonderful job getting its point across. 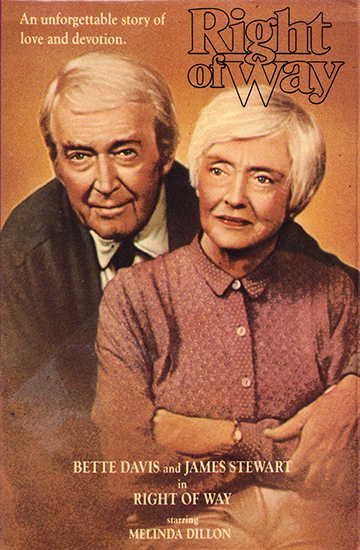 Bette Davis and Jimmy Stewart are both amazing together in this film and we can really feel for their characters. This script does a great job making us care for people who make a decision that many people would disagree with. This film’s plot still remains quite controversial even after 35 years but they manage to get the point across really well for us to appreciate the way that the story is told. Highly Recommended!